LOS ANGELES (Reuters) - The California Senate voted on Tuesday to raise the legal smoking age in the most populous U.S. state to 21 from 18, in a move that could make California one of the states with the highest smoking age. The measure was approved by the Senate 26-8 and must now be approved by the state Assembly. "We will not sit on the sidelines while big tobacco markets to our kids and gets another generation of young people hooked on a product that will ultimately kill them," Senator Ed Hernandez, a Democrat and the bill's author, said. "Tobacco companies know that people are more likely to become addicted to smoking if they start at a young age,” Hernandez added in a statement. The Institute of Medicine, the health arm of the National Academy of Sciences, has said that increasing the smoking age to 21 would result in more than 200,000 fewer premature deaths nationally for those born between 2000 and 2019. The Cigar Association of America opposed the bill, contending that 18-year-olds can serve in the military, vote and sign contracts and should thus enjoy the right to smoke, according to the Los Angeles Times. David Sutton, a spokesman for Altria Group Inc, the parent of Philip Morris USA, said in an emailed statement that Altria believed states should defer to the federal government and "allow FDA and Congress the opportunity to think through this issue further before enacting different minimum age laws." Representatives for R.J. Reynolds Tobacco Company, a unit of Reynolds American Inc, did not return calls seeking comment. Hawaii lawmakers approved a measure in April to raise the smoking age to 21, and that is awaiting the state governor's signature. Democratic Governor David Ige has not indicated whether he will sign the measure, and has until June 29 to decide whether to veto it, a spokeswoman for his office said. Since 2013, New York City has required tobacco purchasers to be 21 or older, according to the National Conference of State Legislatures. 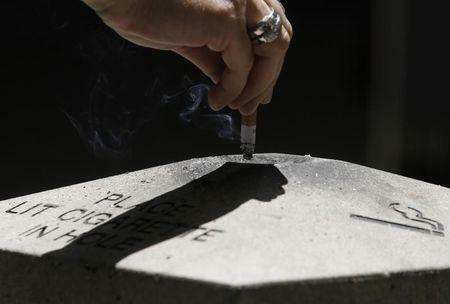 No state has a smoking age that high, but Alabama, Alaska, Utah and New Jersey set it at 19.